Sometimes the messiest things are the best. I mean, I know the benefits to a good picture. No one wants to see what your kids REALLY look like. They want to see your kids with their hair combed, clean clothes and socks with no holes. On any given day you will find my kids walking around my house in soccer shorts, no shirt and Cheerios stuck in their uncombed hair…at 3:00 in the afternoon. I mean, it is summer and all, so it’s a little more acceptable, but you knowww. So basically the same thing applies with desserts. Or really food in general. If it’s all sloppy and messy, apparently it’s not as appealing. 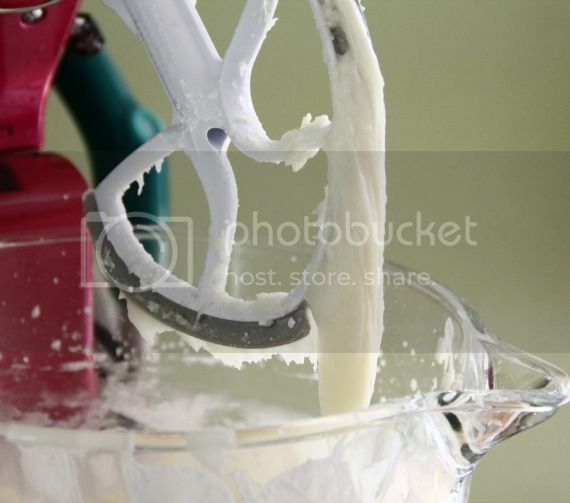 Because if you had an icing smear…gasp! It wouldn’t look delicious. Well, I am here today to break the mold. This “pie” isn’t perfect. It’s actually not even a pie. I mean, there is kind of a crust…is that the defining characteristic of a pie? Well, whatever, I’m calling it a pie. This whole thing is a pretty easy situation. Then press it evenly into the bottom of the pan. The mix together some sugar, cream cheese and peanut butter. Then chill it for about an hour and eat it. 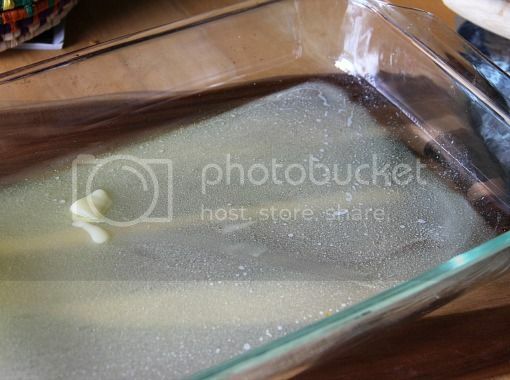 Pour melted butter into 9×13 pan. 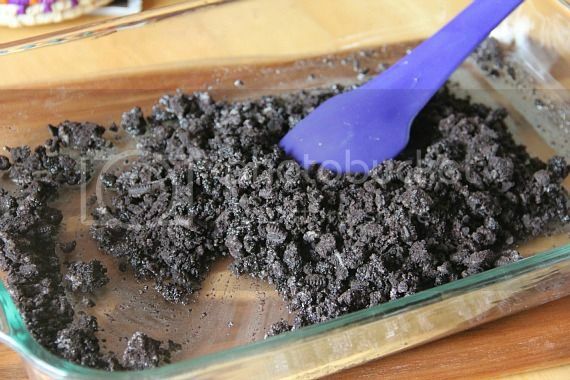 Pour crushed cookies in with butter and stir until evenly combined. Press into bottom of pan. 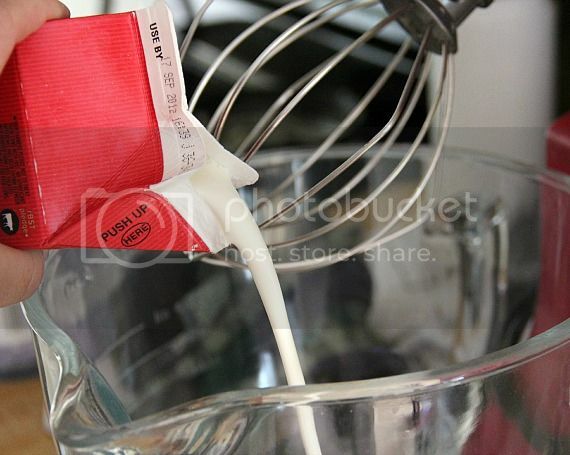 In stand mixer fitted with whisk attachment pour your cold heavy whipping cream into attached bowl and beat on medium high for approximately 2 minutes until stiff peaks form. Set whipped cream aside. In your stand mixer fitted with paddle attachment, beat together cream cheese, peanut butter and powdered sugar until smooth. 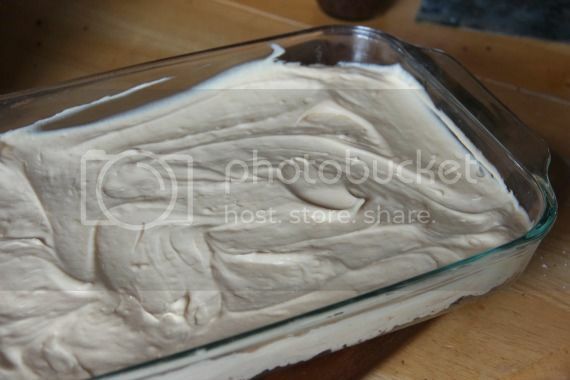 Fold in your whipped cream into the cream cheese mixture until evenly incorporated and spread over prepared crust. 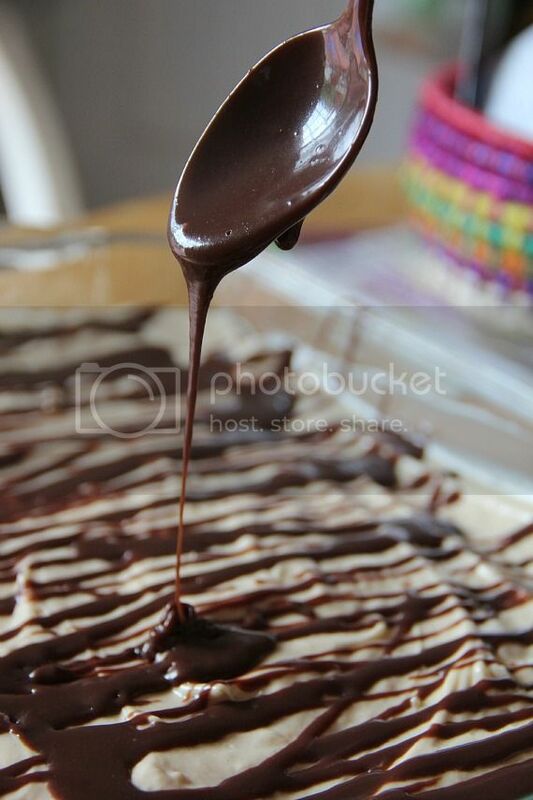 Drizzle with chocolate sauce, if desired. store in a covered container in refrigerator for up to 3 days. I am from New Zealand and have just recently stumbled across your scrummy website! This is awesome – we dont really bake this decadently over here – but I have printed off many of your recipes to try! YUM! Thanks so much for starting this site! If looks could kill… well, uh, I’d be super dead because those drizzly pictures are gorgeous. Way better than some “perfect” cake slice. Whatev, gimme a spoon and let’s get dirty. Me and the pie. Not me and you. Juuust wanted to clarify. this looks amazing!! i love the simplicity of it and how “messy” it looks – it makes it look more authentic and something like you’d have as a childhood treat or something that you’d make with your mom…love your creativity with every dish!! This is perfect for summer. There is nothing wrong with some messy pics (and these are NOT messy!!) – they’re gorgeous. But yes, the messiest/sloppiest food is usually the best. 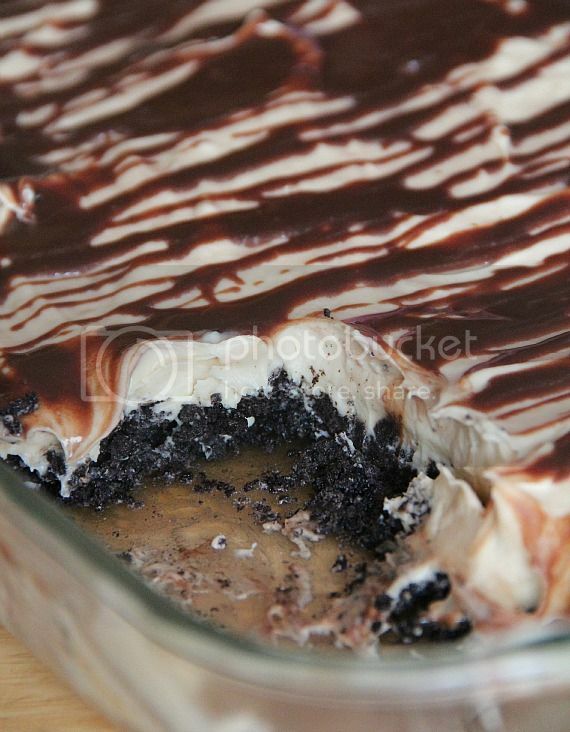 Cream cheese, PB, Oreos, butter…awesomeness. Peanut butter pies are the best and this one looks delicious and simple! OK this look ridiculous…and delicious! Can’t wait to try it. But one question (and I hope I’m not such a drip that I missed it) how much butter do you melt for the crust? Oh gosh!! It’s a 1/4 cup of butter.. I will fix that in the recipe! I’m a pretty messy person in general so this pie is totally meant for me! I know it. My brain read that as “sloopy peanut butter pie” at first and I got excited thinking I found another buckeye football fan, getting ready for football season with a spirited peanut butter and chocolate treat inspired by the buckeye candies. But regardless, I still love this as a sloppy pie! I love that this dessert is sloppy. Sometimes, no matter how hard you try, your dessert comes out sloppy. This dessert doesn’t require perfection, but the combo of chocolate and PB are perfect in my mind! I’m a huge slob so I’m all over anything with sloppy in the name. It looks so creamy! And I love that there’s no baking involved. And I love the drizzle on top! I don’t even try with the perfect cake slice thing. I just cut a piece like normal and put it in a plate and call it a day. I admire the bloggers with perfect cake slices, but that’s just not me. I’d love to try this! Unfortunately, my boyfriend has a peanut butter hatred, so I’ll have to find some test subjects! Perfect slices are so completely overrated! I’ll take some of this, please. I so gave up on pretty pictures, things still taste good even if the picture looks crummy. But then again, I have like the crappiest camera ever, and that is my excuse. This dessert looks plenty pretty to me! I don’t think you can go wrong with no-bake chocolate and peanut butter. My belly is still aching from the NYC sweet tour lol……..but I think I NEED this!! and you sold me at no bake!! Definitely a keeper! And this doesn’t even look close to sloppy– beautiful pictures! As always 🙂 And I LOVE that glass bowl you have on your KA. I’m gonna have to go find that on Amazon right now! I need a spoon or shovel to dig in! That is some gorgeous slop there. I’ll take a bowl full. Thanks for making me drool all over my computer. I was sitting here, trying to get some work done… and then I come across this gorgeous, ridiculously decadent dessert. Oh My Word!! I need to unsubscribe for a bit while I am on my Weight Watchers program!! It is soooo tempting when I get the email notice to open it up!! Then I’m in trouble!! as sloppy as it is, it still looks pretty! and it sounds amazing. oven shmoven, you make amazing treats even with limited resources! OMG!that one looks yummie and creamy and absolutely.amazing!I’m a new follower:-) I hope you have a chance to visit my blog too. I have to make a conscious effort not to leave a comment that says, “NOM, NOM, NOM” when I come to your blog, lol! The messiest desserts are the BEST desserts…all smooshy and melty…LOVE it!! And, my kids look very similar to your description most days…it’s even worse cause we Homeschool so they look that way alllll year LOL! On Sunday we got to church and my 4 year old (whose hair I DID comb) had a band aid stuck in her hair…seriously..
Shelly, you’re right. Sometimes you just need to cut loose and let things get a little sloppy. …and eat this pie while you’re doing it! Shelly, your pictures are just gorgeous! And so is that pie, messy or not. Love!! I can never get the perfect slice, just doesn’t work for me 🙂 So I am all over this. Forget about the chocolate and peanut butter amazingness! I think you just proved that “the sloppier the better” is an awfully good motto to live by. This looks darn good! Messier is definitely better with this one. Holy cow YUM!! Looooooooove this. I would totally eat it from the pan with a spoon. Personally, I like messy better! And this is beautiful!!! 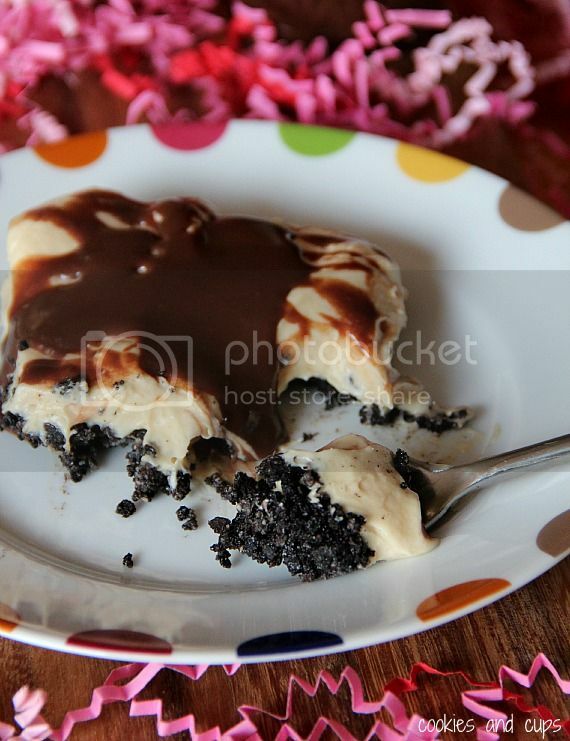 Peanut Butter Pie is one of my favorite desserts ever! I want this so bad right now. Someone needs to invent one of those Star Trek food delivery systems! My god, I wish I had a huge slice of this right now… it looks so freaking good!!!!!!!!! Just made these. Gotta say they were pretty good!! And fairly easy to make. Def manking these again! Thanks!! I have been making a variation if this for about 12 years now and it is a home run EVERY time. If you are pressed for time you can also buy the chocolate graham cracker pie crust. Love this website. Keep them coming! I accidentally bought the mint Jo Jos from Trader Joes, but it gave the dessert a nice holiday twist, and it went over really well at my family’s annual Christmas party! How fun! I would have never thought pb and mint would work! I’ll have to try that! I made this for my niece’s 13th birthday last September, and I am planning to make this again for Easter this year! It is so good and not a “sweet” dessert, it’s just heavenly! 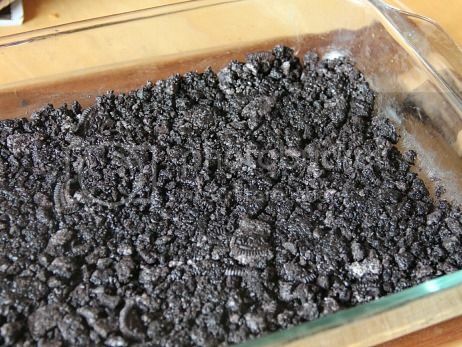 Thanks for this keeper recipe, I will be making it many more times as my family all loves it! Sloppy or not, these pictures look amazing! Going to make this for the next family get together! Thanks for the recipe! it looks delicious. Does the buttercream makes it sweeter? Can i replace it with something else. There is no buttercream in this recipe. Sorry i ment peanut butter.